There is nothing better at bringing out the flavour of foods than balsamic glazes. Appetizers will never be the same once you start adding the dynamic taste of a balsamic glaze to them. Here are 3 of the best appetizer recipes and ideas we have come across that make guests reach for more, time and time again. You’ve probably served bruschettas before at one of your dinner parties but now you have the chance to bring them up to a brand-new level with a balsamic glaze. 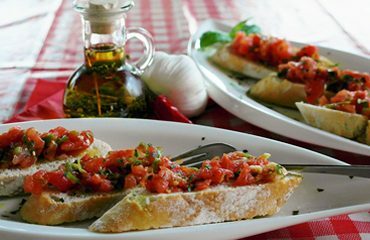 Use your favourite bruschetta recipe including onions, basil, garlic and tomatoes immersed in olive oil to bring out all of the intense flavours. Once the mixture is placed on a piece of toasted garlic bread, drizzle it with a balsamic glaze as the ultimate finishing touch. This is gastronomy at its finest. This is an easy appetizer to serve when you are struggling at the last minute to put together an out-of-this-world appetizer that your guests are sure to love. Start by running fine lines of a balsamic glaze across the serving platter before placing any prepared food on it. Then, simply rest the fruits or vegetables on the glaze before drizzling a small amount of extra glaze on top of them. Basically any type of fruit or vegetable can be served in this manner and don’t be afraid to mix and match a variety of different veggies and fruits on different serving plates. This is an amazing recipe that you can cook up in no time at all. Dress up any type of mushroom with a balsamic truffle glaze. Simply fry up regular button mushrooms or portobello mushrooms with shallots in a pan with olive oil and cook until the mushrooms have released their liquid. Spoon onto a serving dish and then drizzle the mushrooms with an amazing balsamic glaze with truffle by Viniteau. These are fantastic appetizers that are easy to prepare but will leave your guests wondering how you ever found the time to put them together. These are just a few of the delicious appetizers you can make with balsamic glazes from your kitchen pantry. There’s no better way to add a spark of luxurious taste and aroma to your appetizers than by using a balsamic glaze. These glazes have become a well-kept secret by many chefs and now you can use this secret to your advantage as well. To see an assortment of balsamic glazes that you can use on your next appetizers please visit www.viniteau.com or feel free to call 1 (800) 206-1177 for pricing. These are the glazes that should be lining the shelves of pantries in fine restaurants and residential homes across the country.